Fog enveloped Bourbon Street. We stepped inside a dimly lit gift shop in New Orleans where we spotted a book on ghosts. Like Lestat, he was an imposing figure – tall, dressed in black, and blond. But Richard’s hair was long and braided. He could have passed for an outlaw, but he was a very entertaining storyteller. Our tour was briefly interrupted outside voodoo Queen Marie LeVeau’s home. I doubt she was resting in peace as a heckler chose that moment to hassle Richard. Several paying customers urged Richard to move on and continue with his stories. He did. Our next stop was at a voodoo woman’s home. Except for a huge snake curled up in a cage, lit candles, burnt offering and dolls with pins in them (OK, I made that last part up), the voodoo woman’s home was like any other. She gave us a quick tour. Then, we gathered in the backyard. The woman asked Richard if he wanted his future told. Perhaps, thinking of the unpleasant encounter, he just shook his head sadly. “Knowing how bad my past was, I don’t want to know what my future will be,” he said. We laughed and Richard joined in. After we left her home, we continued our stroll through the French Quarter. Each block appeared to harbor spirits. 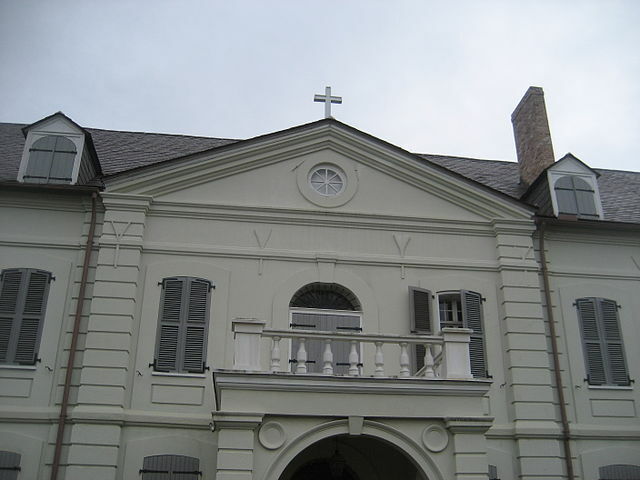 Richard stopped at one building, the Old Ursuline Convent on Chartres Street, and told us about suspicions that it was connected to vampires. In the mid-1700s, young women were brought over from France to be married off to men who settled in Louisiana. The nuns at the convent gave the girls shelter and an education. While there were women in New Orleans already, some were plying the world’s oldest trade. Definitely not marriage material. Odd! Many were dying in France at the time. So, there should have been a shortage of coffins – not chests – for their clothes and personal effects. Their chests, containing a dowry, were locked in on the convent’s third floor. They would be opened when the girls married. But Richard said the chests were empty. The shuttered gable windows on the convent’s third floor are nailed shut, he said. Superstitious residents say that was done to prevent any vampires – believed to be in the coffins – from escaping. We hastened out steps as we left the sidewalk outside the convent. Would a light from the moon reveal that one of the windows was open? Mysteriously, there is no record of what happened to the 50 coffins. He wrapped up his story by telling us that in Rice’s “Interview with the Vampire,” the vampire has beignets (a pastry with powdered sugar) at Café du Monde. 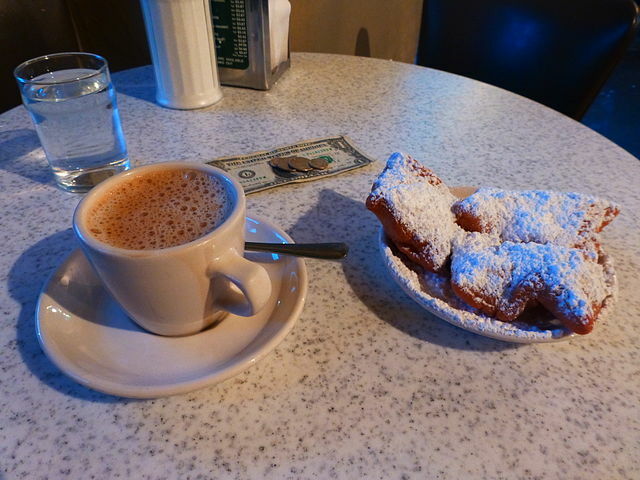 The truly spooky thing is that lighter-than-air beignets do vanish into thin air along with the coffee. Richard’s stories, however, have stuck with us for many years. Do you have a non-gory spooky tale to share? I’ll be heading to New Orleans in a while for a conference. I can’t wait to check out some of the sights. You’ve given me something to look forward to! You had me at beignets! It’s been so long since I have been in NO. Oh the food. As for ghosts, not much contact. Perhaps I’m not interesting enough. Pretty sure we have a spirit in the house. I hear noises at night that I can’t explain. If I ever make it out to New Orleans, I will take a tour like that Judy! Interesting story about the women from France. Is that why folks speak French there? Fascinating! There are a number of tours like this, Diana. We took ours years ago, but it was a night I won’t forget. 😉 The U.S. bought 828,000 square miles of France’s claim to the territory of Louisiana (the Louisiana Purchase) from the French in 1803. According to one web site I looked at, residents in Louisiana spoke about 10 languages including: Creole, French and Cajun French. Very cool! It is very cool – what a rich history! “If you know your future, your past may look good.” That’s spooky enough for me, Judy! I love the first photograph in this post of the wonderful old cemetery shrouded in fog….as they always should be. And yes, beignets are….. to die for! The voodoo woman’s comeback really made me laugh. Yes, it is kind of spooky. I don’t think the photo is from the New Orleans’ area, but it certainly works for me, too. Thank you for your comments, Barbara. Oh, and what a fun song!! Great post, Judy. Especially the “made up” part about pin-stuck burnt dolls. I don’t have a spooky story to tell, but I enjoyed your tall tales – and the history – all the way through. My husband Cliff recently came back from Naw’lins after his fall tour with a box of beignet mix, now sitting on our kitchen counter. Yes, New Orleans does have a mystique, with some similarities to those of Savannah, another city with spooky tales if you have read John Berendt’s Midnight in the Garden of Good and Evil. John Berendt hails from Central New York where my husband, Dave, and I used to live. We bought an autographed copy of his “Midnight in the Garden of Good and Evil” at a bookstore in Savannah, Georgia. Yes, another city with a long history rooted in mysterious tales. Unfortunately, I’ve never been to New Orleans but have always wanted to. It must be a great place. I think I would. It must have a real atmosphere. I too love the voodoo woman’s comeback! 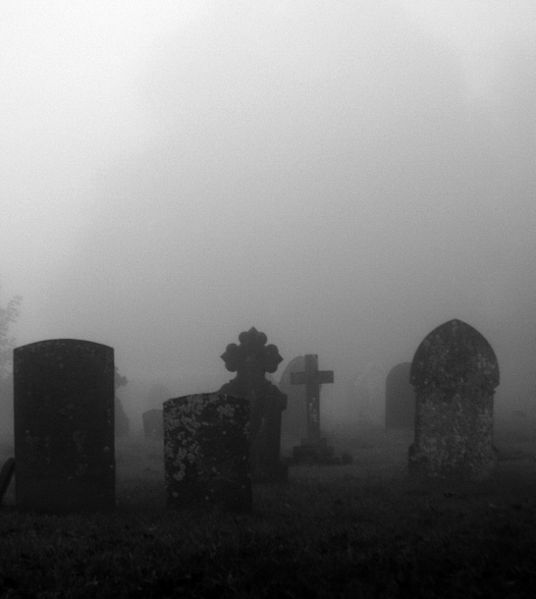 And your foggy cemetery photo sets the mood for the terrifying tales. This is a perfect post for the Halloween season and makes me want to go on our local Ghost Tour too. The voodoo woman did add a light moment after all those scary and strange ghost tales. Thank you, Dor. Ooh! A local Ghost Tour! I’d be there in a heartbeat. Go and have fun! I went to a ghost hunt lecture at the Landmark Theatre, on assignment for the big daily, Judy. Hosted by noted ghostologist Stacy Jones, it started late one Saturday night and lasted until the Syracuse Sunday sunrise. I went with reporter’s pad, pens and sleeping bag, an odd addition to my usual equipment but on the list given to all participants. Stacy set the mood to us collected thousand, in different stages of belief certainly, talking of her many experiences hosting the ghost hunters show for the big cable network and reading passages about the famous ghost of our downtown Syracuse theater palace. We toured the dark, dank, unavailable to the public basement corridors and cement rooms as well as the upstairs lobbies and main floor auditorium and backstage area and every nook and cranny of the place. I hung out with a family I’d met previously, parents my age of twin musician daughters in their 20s. Upstairs they took photos, and we looked in the back of their digital camera and spotted the light spectres that WERE NOT in the bathroom lobby when they snapped the photos. I know. They knew. Not there. I grouped in a solid basement room with a dozen others as we heard a can of nails fall from a wall shelf with a thud when none of us were nowhere near it. I huddled in a “hot spot” in the upstairs balcony” around a ghost monitor and heart the scanner-like device stop on a voice that spoke my name, Mark, coming out much like TV alien Mork said the person next to me now knowing who I was or that it sounded too much like my Pop Pop”s voice with his Brooklyn accent. No, I did not use that sleeping bag. I met the sunrise at our little house in Eastwood and wriote my feature story to meet my CNY section deadline because I had to be bright eyed and enthusiastic early Monday morning to drive with my dear wife Karen to Niagara Falls to get married at City Hall, our secret, which I was glad the voice on the monitor had not told. Mark … I did an interview years ago with folks at the Landmark Theater. That is one spooky place. One man told me he was going down that narrow staircase and it felt like a broad-shouldered man bumping into him. Brrrr! Oct. 27, our sixth anniversary, Judy. Thank you! One year in college we took a ghost tour in New Hope, Pennsylvania where Aaron Burr and Alexander Hamilton dueled. It is a quaint town and it was a cool October evening, but your ghost tour sounds like it had a lot more mood to lend to the stories. A ghost tour with a bit of history. Paprika, that does sound like a promising evening as well. Did you hear a musket fire? Interesting tale of your spooky ghost tour Judy! I don’t blame him not wanting to have his fortune told, I don’t think I would either, even in fun. Words can be powerful, I’m careful who I let speak them over me! 😉 And saying if he knew his future, his past might look good – mm… not very encouraging that! Reminds me of one of those old 70’s Hammer Horror movies, there was always someone having their fortune told by some creepy woman. Quite often the tour guide!! And for those unmarried girls with coffins – ugh, that’s very strange indeed! Was that pure fantasy, or was there some truth in that tradition of keeping a dowry inside a coffin? I’ve never been on a ghost tour, probably because I’ve never really believed in ghosts. We do have regular ghost tours in the city where I live, as there’s a castle and a cathedral that are almost 1000 years old. So if there are any ghosts in this world, there should be a whole load of them floating round in my city!! 😀 I did go on a tour of the castle as a teenager, many years before I moved there as an adult. There was all the usual chains hanging on the prison walls and various torture implements, and if that wasn’t scary enough we were then subjected to one minute of complete darkness in one of the prison cells. I wasn’t really in the habit of holding on tightly to my mum at sixteen, but I did in that day! It was one of the things that stood out as most scary to me, experiencing what it would have been like at night in a prison cell once the natural daylight had gone. The only light they would have had was if the guards brought a new prisoner to the cell, they would have carried burning torches. Not much of a comforting thought!! Suzy … I’ve had a couple of readings. One man predicted the exact day I would get a job offer and he was right on the money. The one that unnerved me, though, was a woman who told me about a letter I’d gotten from my sister (who had died a few years earlier). When I went home and checked my sister’s letters, the psychic was right about something that I had long since forgotten. Eerie. I never went back. The “casket girls” and their history can be found by a Google search. I’d written some things down that the tour guide told me. But there is a bit more available on line. I loved this from the moment I saw the photo and my favorite part was the sad outlook of the man who had given the tour. He sounds so sad, sorry someone heckled him, which makes him feel he doesn’t want to hear his future. Great answer and lots of laughs there. I liked the snakes and details, you shared in this post, Judy! I always knew those beignets are under a spell. Irresistible good with every bite! What an exciting tour. Had me all glued and wife eye! Thanks Judy. I have been wanting to go on a ghost tour for years. Your post really makes me want to know. I must do this!! I love your story telling. New Orleans has always intrigued me Judy. Now your spooky story makes me want to visit even more 🙂 Love that Misty graves opening photo.